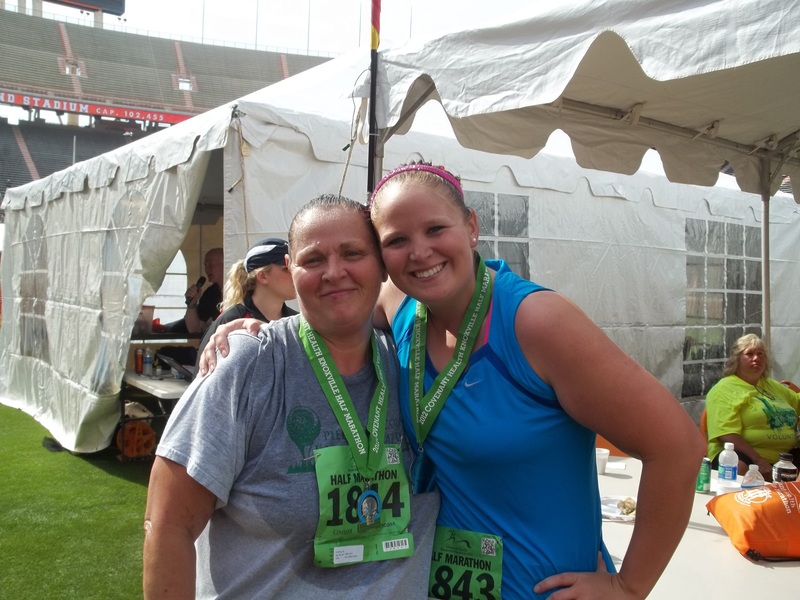 Momma walked her first half and finished strong. Blogging friend Vanessa came to town to stay with me and watch the race. I saw months and months of hard work from our staff come together into a flawless event. Other relevant info: When it comes to running a half marathon, most normal people would spend at least a few months or maybe even more training for it and preparing their bodies for the challenge of 13.1 This was my 8th half and I am no stranger to them although I have only ever “officially trained” for one and even then there was not a lot of running involved. Nonetheless, I willingly signed up for the half this year and sort of banked on my rowing workouts to get me to the finish line, even if it meant finishing slower than last year. Being on staff made it a better decision since I got to particpate in an event that we worked so hard on. 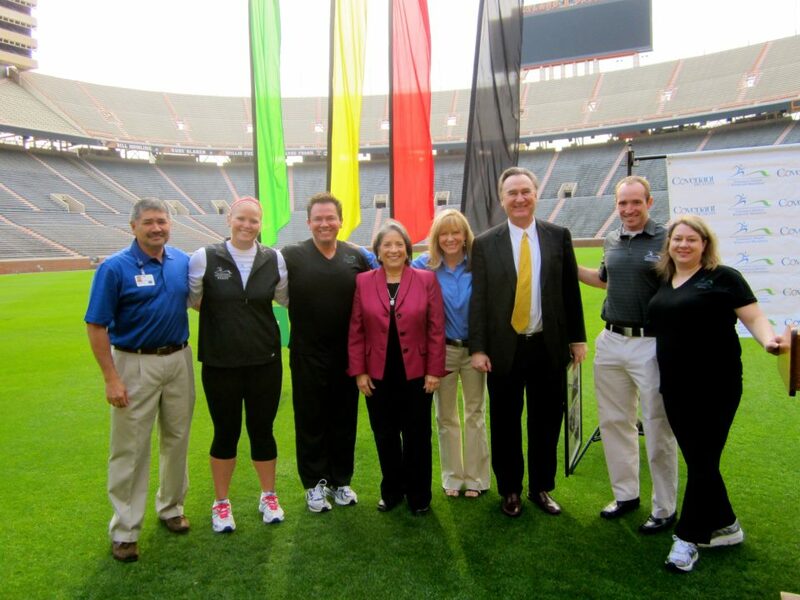 some staff and members of BW with Knoxville mayor at a press conference a few days before the race. The week leading up to the race had lots of excitement. I was fresh off a 5k PR and busy getting ready for marathon weekend festivities. The Expo officially kicked off the excitement. Since we spent Friday setting up, I got a sneak peek of the vendors’ selection so I knew exactly what to scope out. I ended up scoring a great new pullover with the marathon logo on it, some shorts and shirts from New Balance for my Momma and Big Sis, a new car magnet, and had my photo made at the Covenant photo booth. After shopping and browsing for a bit, I set up camp at my work station and prepared to work for the next 10ish hours. We had a phenonemal group of volunteers show up to help us out. People from all walks of life were there to help runners out. I was especially thrilled when some of my friends and teammates showed up to help work. It made the day go by so much faster. I saw so many familiar faces and even got to meet a few new ones! Loved making new friends in such an inspiring environment. After the Expo, I headed down to Market Square to meet up with my blogger turned real life friend Vanessa at a pasta joint. I’m not one to “carbo load” but hadn’t eaten all day so figured I at least needed some fuel going into race day. Vanessa’s friend Julie (plus her family) were all there too since Julie ran her first full marathon on Sunday. 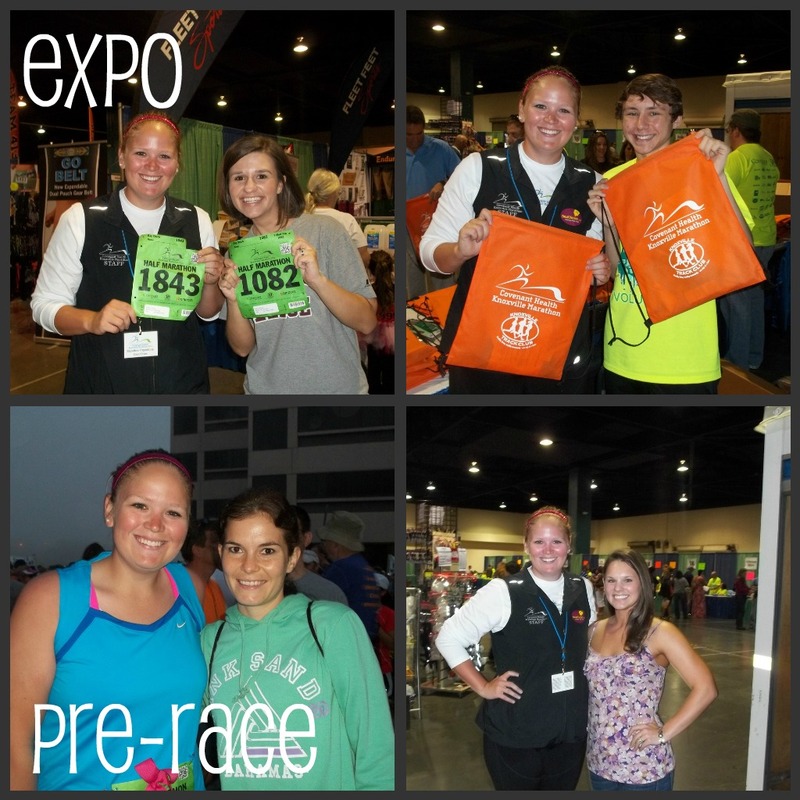 It was great to officially meet a blogger and real life and get even more excited for race day. Following pasta, it was off to buy cupcakes, cookies, and s’mores bars. Perfect pre and post race food. Yumm. After making it back to my apartment, Vanessa and I chatted for a while then it was off to bed for race day. I didn’t sleep as well as I would have liked, but I will blame it on the sweets and not pre-race jitters. 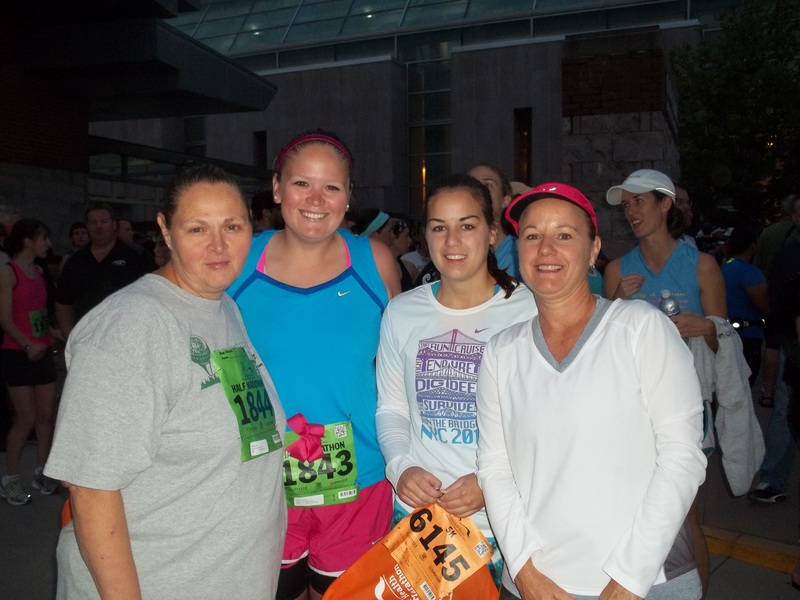 Race morning came and we met up with my sweet Momma and our friends Donna and Kayla. My sweet friend and co-captain Robyn texted me the inspring words from Cool Runnings (fave movie): “I hope you are feeling very Olympic today”. Yes, Robyn. I sure was. I live four blocks from the start line so we got to take our time a little. After sending our things to bag check we hopped in portapotty lines and actually got stuck in them even after the gun went off. I didn’t have an urgent need to use the restroom so I just hopped in a coral and took off. My main goal was to just complete the race so I didn’t have an exact strategy in mind, although in the back of my head I would have loved to set a PR and break 2:30. I made the decision to at least run until the end of Neyland which marks mile 3.5ish. This is the route we run for rowing practice so I knew I was at least capable of that. After reaching that point, I decided to make it to Sequoyah Hills and then walk when needed. It was about this time that the 5:00 pacer (2:30 half) passed me. I didn’t think I was going that slow but I decided to not let it bother me and just run my own race. I was not breathing hard and my legs felt fresh so there was no reason to stop, slow down, or speed up. Sequoyah Hills came and I just kept on trucking. Mentally I knew that I would have to walk at some point because the hills were brutal. I took some water and gatorade at mile 6ish and it felt good. 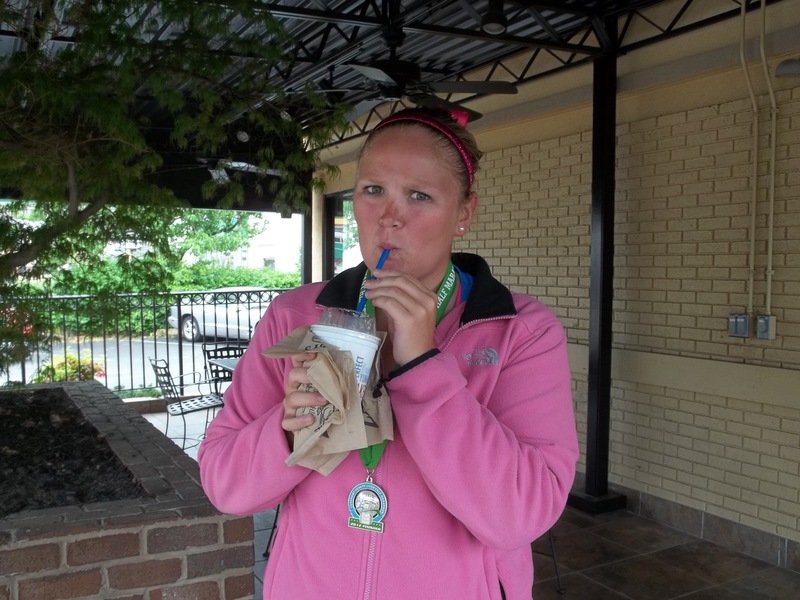 I don’t fuel with anything during runs except for a beverage. Probably need to work on that. Before I knew it, we were out of the neighborhood and I still had not stopped. Hoorah! However the executive decision was made to powerwalk to notorious Noelton Hill. I walked as fast as my legs would carry me and as soon as I hit the top I took off running. My split time shows that I must have made up for the walking by running faster because my time for that mile wasn’t terribly off. I hit mile 8 at almost the exact same time as I did during my 8 mile training run (my only training run) a few weeks prior. The greenway portion of the course was coming up including the section that I had ran my 5k on the week before so it was mentally encouraging to have that part to run. Main goal: don’t stop running. I made it the entire greenway without stopping then around mile 11 we hit Tyson Park and I slowed down to grab a cup of gatorade (or two). That’s when I finally felt the first ounce of pain. My left knee and the area surrounding it began to feel a lot of pain but I knew that if I just kept moving I could deal with it at the finish line. Mile 11 and 12 run through the Fort Sanders area which means lots and lots of hills. At this point in the game, I had already beasted my personal-distance-no-stopping record so I figured a little walking would be okay as long as I could run the last mile. My splits show a significant slow down on those two miles, but then mile 13 is when it all came together. I started running and decided not to stop until I crossed the fifty yard line. From mile marker 12 to the finish line I did not stop smiling. My body felt great and the crowd was supportive. I could see the stadium in sight and could not wait to be inside and have my face on the jumbotron and have my name called over the speaker. I ran and I ran pretty good for the last mile. As I rounded the last corner before heading onto the field, I caught glimpse of Vanessathere cheering me on. That last bit of cheering really helped me push hard into the finish. And that was that–a new PR and half #8 down. I grabbed my medal and made my way to bag check. Since I had my staff pass I was allowed back onto the field and somehow Vanessa made her way all the way around the stadium and was there to take my picture. It was so exciting! She had to skidaddle to meet up with her friend at the 20 mile mark so I headed over to the VIP tent to grab some gatorade and pretzels. Every half (and most races) I have done, I get sick afterwards. It isn’t always immediately after but usually within an hour or two. It was all I could do to keep my body moving and not get sick until it was time for my Momma to cross. She walked the entire thing. I was a little emotional about it and I think she was too. She had her camera out videoing herself crossing the finish line. Such a proud moment and I’m so glad I was there to greet her afterwards. Following Momma’s finish I was still feeling good and sickness had not plagued me so all was well. We waited around with some friends to watch other people finish and that was such an exciting thing. If you want to be inspired then wait until every half finisher finishes. The back of the pack people always have the most inspiring stories to tell. Lots of photos were taken then it was back to my apartment for cupcakes. Momma and I chatted for a bit then she headed out and I went back to get Vanessa. We had a post race lunch at the Mellow Mushroom which was completely greasy and delcious. It was her first time there which was hard for me to believe, but still some good eating. She had to hurry off to Georgia so I dropped her at her car then met up with my “other family” for milkshakes. I think it was well deserved. 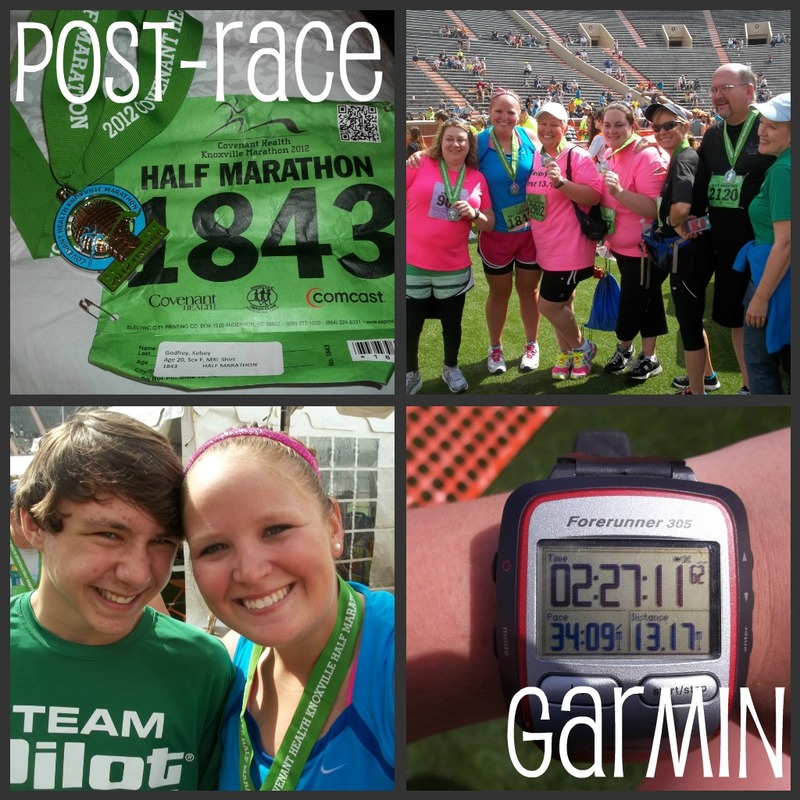 Reflecting back on this race, there is not one single thing I would do differently (besides learn to run even faster). I paced myself good, I never breathed hard, nothing hurt until mile 11, and I finished strong and managed not to get sick. Sometimes when it comes to running there are days you have it and days you don’t. Yesterday was definitely a have it day and I sure was feeling Olympic. I told a cameraman after the race that my cheeks hurt from smiling so much. Great day for racing and great day for being a runner. Oh, and congratulations to ALL the finishers, especially my training partner Michelle who ran her first half and overcame injury at the last minute and ran a super strong race. And thanks to Vanessa for coming to meet me and trusting me enough to stay the night with me and watch me run. finisher's tape. I beat the Kenyans. Did you race this weekend? Have you ever had a blogger stay at your place after meeting them? Ever been to a race and had a parent or sibling do it too? Tell me some good half stories! I run the Blvd when I’m at home — I NEVER run up noelton — way too tough! 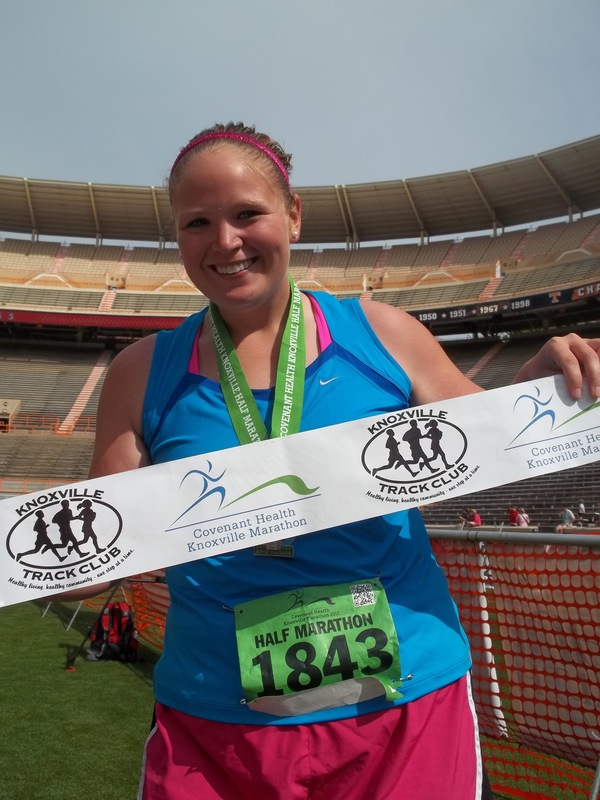 I would love to run the half sometime in Knoxville, but I could never do the full — way too hilly!!! Love this!!!! Congrats again on such an amazing race! You and your momma are both amazing and inspiring women 🙂 can’t wait to hang out in utahhhhh soooo soon! Your mom looked strong when I saw her before Cherokee blvd then she took off couldn’t catch her!!! absolutely AWESOME job!!! Such a great accomplishment and so happy people were there to cheer you on to the finish line!!! great job on the PR too 🙂 you’re a rockstar! That’s cool that Vanessa could come up and meet you. I have met up with other bloggers and stayed at their houses and it’s been great. Everyone is pretty much how they seem on their blogs, so far! 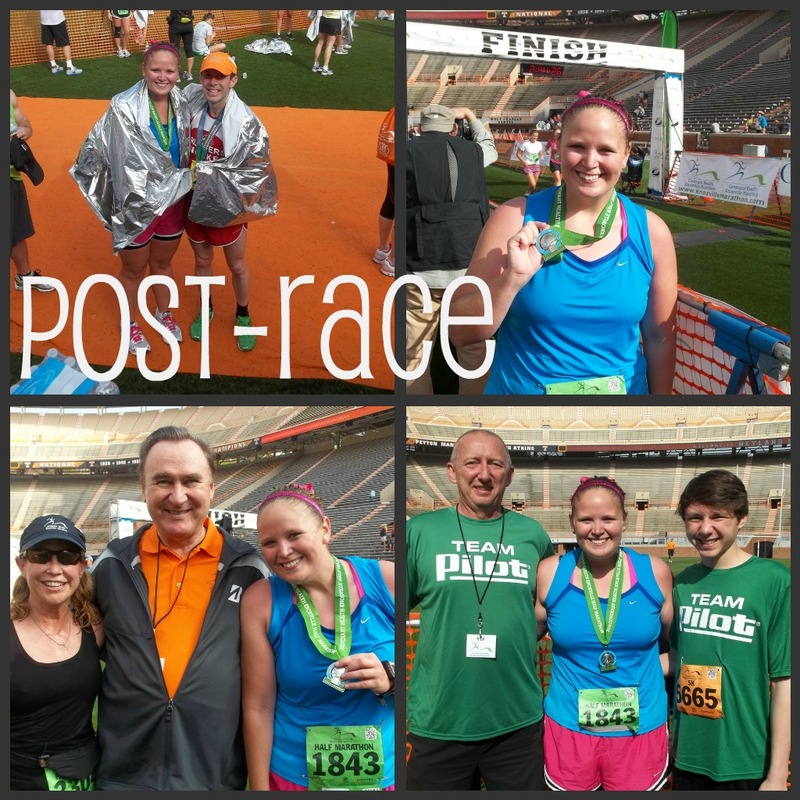 Good job on the race; that’s so fun that you could organize it AND participate in it! How rewarding!